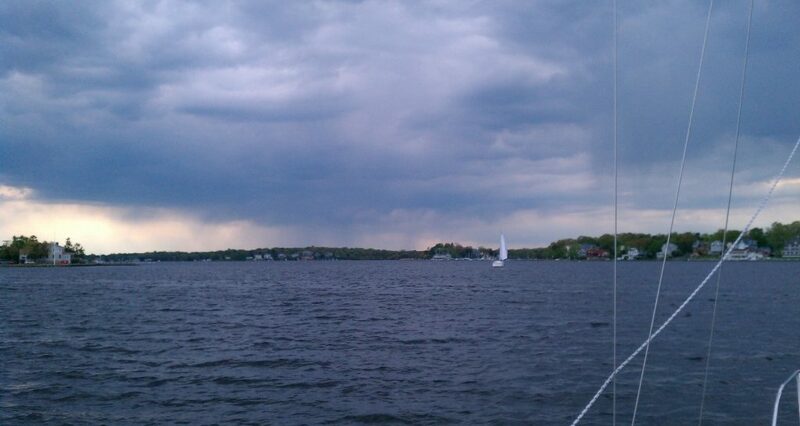 Sailing season is ramping up. We stopped by Cedar Creek on our way to the boat to pick up a new tiller cover from The Ship’s Tailor, and the yard was full of busy people sanding, fairing, and painting. We also ran into Richard while we were there and had a chance to pick up a Windjammers burgee, which was presented to us with exactly the correct amount of formality and sarcasm. After greeting a couple other Windjammers, we made our way down the boat and loaded in a few of our cushions and other sailing junk. I asked that Jen stand at attention while I raised the burgee and we made our way out of Trixie’s. Some Windjammers were having a lunch cruise on The River Lady, Toms River’s very own riverboat, and although there was very little chance of us catching them, it was as good a reason as any to head north toward the Toms. The forecast of 7-10kts was off, as usual, and it was more like steady 15 with gusts in the mid 20s according to the history on the wind charting sites. We sailed up on a full main and partially furled jib, making good time. Jen used some chartplotting software on her Android phone and for the first time, we were able to actually track our speed, which hovered in the 5kt range, with a high of 5.8kts as sailed into the mouth of the river. It was well past lunch time and we decided to anchor and make some turkey sandwiches. We’ve never anchored in Toms River so we weren’t really sure where to go, but settled on the entrance to Mill Creek because…well, that’s where we were when we got hungry. Such is the freedom of sailing. We tucked in behind the windward shore to get some shelter from the west wind and it turned out to be a nice spot. If it had been a busier time of year we may have been a nuisance to boats trying to enter or exit the creek, but it was quiet. In fact the only traffic we saw was a singlehander in a pretty Compac who had turned in toward the creek in order to raise his main. This photo is not upside down. That’s just the view when lounging in the cockpit. Our quick lunch turned into a lazy 90 minutes of napping in the cockpit and enjoying a nice spring day. Unfortunately, some unforecasted rain appeared on the horizon, and we decided to hoist sails and start heading toward home just in case the weather turned. As the storm approached, the wind actually quieted down (I think we may have literally been stuck in the calm before the storm) and we were barely making 3kts running wing and wing on the way out of the river. When the rain actually got to us, we decided to douse the sails and fire up the motor so that we could pull up the keel and run across the flats in front of Good Luck Point. Our only difficulties of the day involved getting the boat back on the trailer. The west wind was pushing the boat away from Jen and to the port side of the trailer, to the point where we had to switch jobs. It took us three or four tries to get it centered. Jen wasn’t quite able to get the boat pulled in as far as usual, but we thought it was close enough. We went through the entire process of positioning the boat back next to the obnoxiously-placed catboat, only to find that with the boat back that far on the trailer, the tongue was kind of neutrally buoyant. When I released the hitch, the trailer popped up a couple inches and started clawing the paint from my bumper. To fix it, we had to put the boat back in the water and re-park. All in all, it was a really relaxing day, and we were glad that we had our lazy time at Mill Creek.